This blog is dedicated to those interested in exploring SAP standard Fiori apps for Finance in S4 HANA. I would be specifically focussing on the apps that are released for S4 HANA 1610. Implementing SAP Fiori is a project in itself. It requires several weeks from planning to executing which includes identifying the client needs, conducting design workshops and exploring what SAP has in store for you and then subsequently implementing them. It is not as simple as activating all the standard Apps which SAP provides and assume it’s all over. But I am sure it would be nice if you had a sandbox system with all the Fiori apps configured and in working condition so you know what you are getting into. In this blog, I am going to give you quick guide on how to get all the Finance related SAP Fiori apps implemented in very less time. I have already gone through this exercise and I have captured all the things that you need to activate. All of this information is available in SAP Fiori Apps library. This is just a consolidated set of information so you can save some time in retrieving the same from FAL. Below are all the Apps which you would have up and running in your Fiori Launchpad once you complete the configurations mentioned later below. Also these are only the SAPUI5 based applications and that includes the transactional and Analytical applications. I haven’t covered the FPM/WebDyrpo, Design studio & GUI based tiles which are also delivered by SAP as Fiori tiles. Please note that you need to perform an initial standard Fiori setup to have your gateway and backend system connected and up and running. As mentioned earlier in the blog, this specifically targets the S4 HANA 1610 system. So make sure you have the correct version. Activate all of the below SICF notes. These are all the associated SAPUI5 applications. 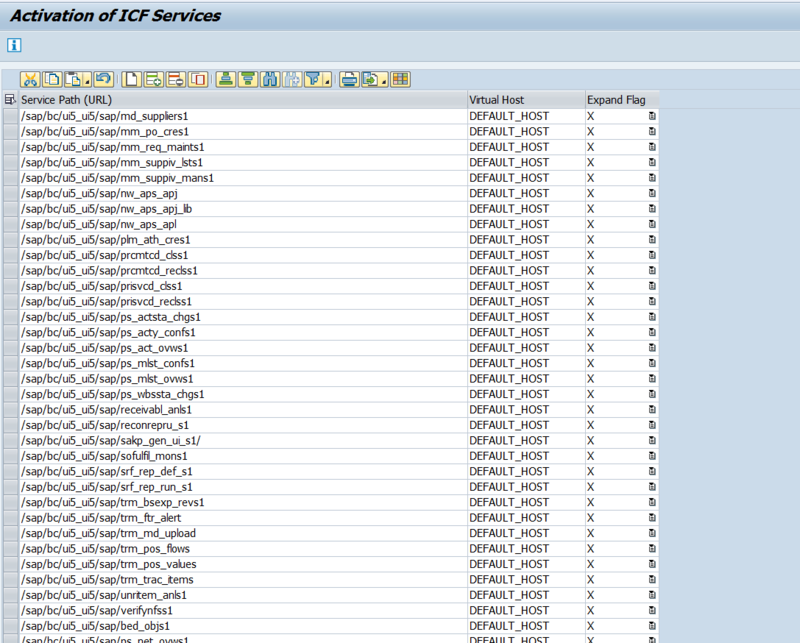 You should use the task list SAP_BASIS_ACTIVATE_ICF_NODES to activate all of them in one go. Next you need to activate all of the below OData services. 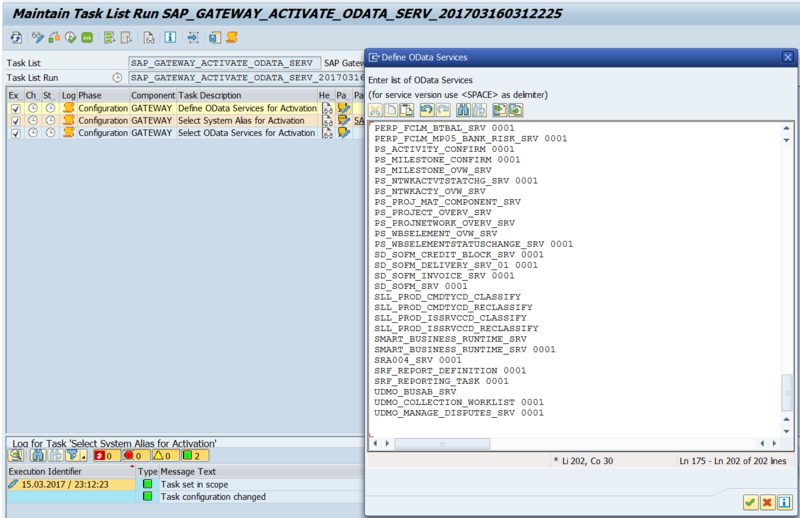 Again, you should be using the task list SAP_GATEWAY_ACTIVATE_ODATA_SERV to activate all of them in one go. And finally assign the following roles to the Fiori users in the Frontend server. These are not the only roles that you will need in a productive environment. Each app could have additional backend roles associated with the business processes that it caters to.But like I mentioned earlier, this is just a way to get all of your apps running in your sandbox environment in minimum time so you can leverage it for your actual implementation project. The actual implementation is a cross team collaboration which includes your Functionals, UX folks, Basis and Security. So for now, you might just want to assign a wider access role to your test users in the sandbox backend system to get everything running. That’s it. Now run your Fiori Launchpad that you should see all the apps up and running. Trying to search for your app on the launchad can be overwhelming. Instead, you can run the App finder app in your Fiori Launchpad to easily explore all the configured apps. Thank you for this article, it is very usefull, but my question is, is there any task list that allow us to assign these activations to Transport Order, to facilitate their transport to other systems? Hi Yassine, did you find any solution regarding to the transportation of those objects to other systems? When I follow the above steps 14 services was failed at the activation. How can check the exact error and how to fix it?